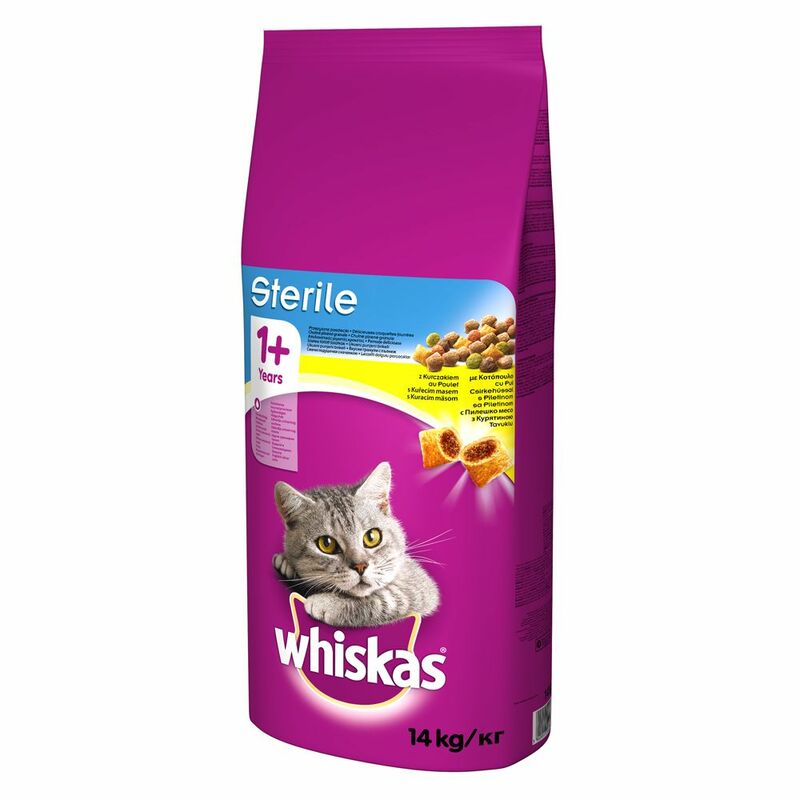 Whiskas 1plus Sterile Chicken is formulated to meet the specific nutritional needs of adult castrated or spayed cats. When your cat is neutered or spayed, its metabolism changes dramatically. Cats no longer need to consume as many calories as they did before they were neutered, but their appetite increases, which can lead to weight gain. This healthy kibble from Whiskas is rich in proteins, but with a reduced fat content to discourage weight gain. Whiskas 1plus Sterile Chicken has a crispy shell and delicious filling and the recipe ensures that your cat eats a balanced diet. The healthy ingredients are enriched with vitamin A, C and E, plus Omega-6 fatty acids. Neutering also increases your cat's risk of urinary tract infections, so the ingredients of this dry cat food have been optimized to promote healthy urinary function and help to reduce the likelihood of infections. The special kibble shape helps to keep your cat's teeth clean and discourage tartar and plaque deposits. This Whiskas dry cat food for neutered cats is free from artificial flavourings. Whiskas 1plus Sterile Chicken at a glance: Complete dry food for adult neutered cats aged over 12 months old Recipe tailored to the altered metabolism of neutered cats Tasty, filled kibbles: crunchy on the outside with a delicious, soft filling High protein content, lower fat: 32% protein and only 11% fat, to help your cat to maintain a healthy weight after spaying or castration Balanced mineral content: supports a healthy urinary tract Supports good dental health: helps to prevent tartar and plaque Healthy eyesight: the high vitamin A content supports your cat's vision Premium quality, healthy ingredients for a balanced nutrition No artificial flavourings In a practical resealable bag: resealing the bag after every meal ensures that the kibble stays fresher for longer Please be advised: the images of the products on our site are for illustrative purposes only and actual packaging may vary.